Shirts With Random Triangles: South Alabama adds DT prospect Desmond Barkley to its 2019 football recruiting class. 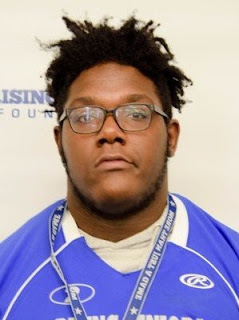 South Alabama adds DT prospect Desmond Barkley to its 2019 football recruiting class. Desmond Barkley. Image via 247Sports. Ready for some Sun Belt recruiting news. Well, you’re in luck. South Alabama has added the eighth commitment to its 2019 football recruiting class. Stockbridge, Georgia rising high school defensive tackle Desmond Barkley announced his commitment to the Jaguars on Wednesday. Barkley is currently unranked by 247Sports. Barkley attends Stockbridge High School in Stockbridge, Ga. He stands 6’2, and weighs 330 lbs.